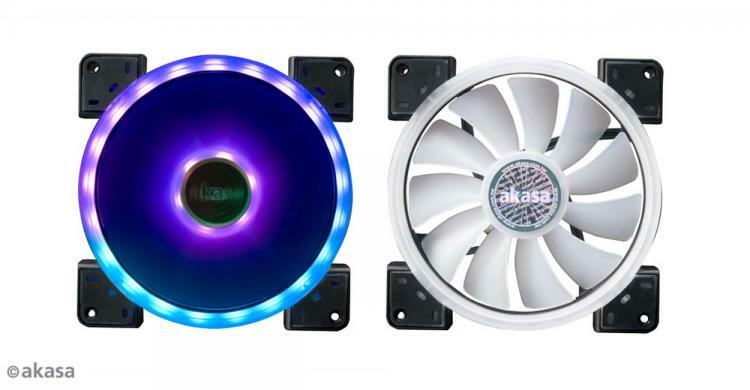 Akasa introduces the Vegas TLX and Vegas TLY twin loop dual-sided addressable RGB cooling fans. The Akasa Vegas TLX is a 120mm cooling fan with 24 addressable RGB LEDs divided among the inner and outer loops. The Akasa Vegas TLY, on the other hand, is a 140mm cooling fan with 27 addressable RGB LEDs divided on the inner and outer loops. Both fans feature a frosted translucent blade to create the brightest illumination along with low noise operation. Both the Vegas TLX and Vegas TLY support standard RGB control devices and motherboard-based RGB lighting control software which includes the MSI Mystic Light, ASUS Aura Sync, GIGABYTE RGB Fusion and ASRock Polychrome RGB Sync. The Akasa Vegas TLX and Vegas TLY with its twin loop dual-sided RGB design offer bright and strong RGB illumination with limitless colour combinations. The fans support standard 5V addressable LED pin headers. Akasa engineered both fans for quiet operation with its built-in rubber dampening pads on the corners of the fan’s frame. The Akasa Vegas TLY 140mm fan has a rated fan speed of 1200RPM with a maximum airflow of 41.2 CFM. The Akasa Vegas TLX 120mm fan is rated at 1500RPM with a maximum airflow of 35.2 CFM.